Despite a losing battle with Mother Nature Sunday, Bristol Motor Speedway provided plenty of action for NASCAR fans this week. Saturday’s XFINITY Series event was the most successful attempt to date at restoring Bristol’s bottom groove. The application of PJ1 TrackBite to the low line through its turns held up well over the afternoon, causing XFINITY racers to fight for the bottom during most of the 300 laps. The primacy of the low groove recalled the style of racing that dominated at Bristol from 1992-2007, leaving many people happy to see vestiges of the high-contact style of racing return. But not everyone was thrilled, as evidenced by this tweet from Kyle Larson Saturday evening. I’d like to hear what the fans think of this bottom groove racing. Only thing that’s made it somewhat interesting to me is these xfinity guys crashin it up in the first half. But hey I guess that’s what some fans want. Larson’s tweet demonstrates a fundamental conflict that occasionally pops up in racing. Sometimes, what the drivers want is the exact opposite of what the fans want. In NASCAR, no track has brought this division to light in the way Bristol has over the last decade. Back in 2007, this short track was the toughest ticket in NASCAR. The combination of a concrete surface and 36-degree banking in the turns created a situation that demanded drivers stay planted on the bottom groove. Passing someone on the outside was all but impossible. Figuring out how to carry speed through the corners while gripping the track was the key to winning at Thunder Valley. Of course, the most expedient way to pass someone was to knock them into the upper groove and out of the way. In a situation where making a pass often required making contact, there was sure to be plenty of torn-up race cars and lots of hurt feelings after 500 laps at Bristol. For many fans, the track’s barely-controlled chaos was short track racing at its finest. 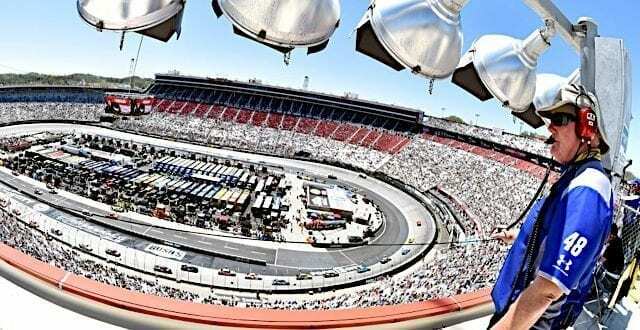 Bruton Smith and Speedway Motorsports Inc. seemingly could not build seats fast enough to accommodate those who wanted to see Thunder Valley’s beating and banging for themselves. However, the drivers were not as enamored with Bristol as the fans were. The difficulty in passing, and especially the restriction in being able to use just one groove, made Bristol a chore for some drivers. Races were often less about competition and more about survival. 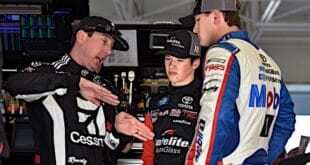 Plus, woe betided any driver who qualified poorly and had to pit on the unfavorable backstretch. It was the complaints from drivers that spurred the introduction of progressive banking to Bristol during a 2007 resurfacing project. The idea was to scale down the banking to 30 degrees in the upper groove but cut the banking even more in the lower groove down to 24 degrees. That way, drivers could run faster through the upper groove, giving them more choices for racing lines and making passing easier. Progressive banking did indeed change the racing at Bristol. The introduction of a viable high line allowed drivers to race side-by-side more evenly than they had before. While the side-by-side action did not always make passing easier, it did give drivers more options for racing at Bristol. Contact was no longer necessary to make a pass. But the absence of a dominant bottom groove meant less drivers “setting up” their opponents to make passes. It meant less contact, less bump and runs, and less temper-related theatrics. Many fans concluded the reconfiguration made Bristol less tough on drivers and that the track had lost some of what made it special. In other words, progressive banking damaged Bristol’s brand. Soon after its reconfiguration, the track experienced drops in attendance. The spring race in 2010 broke a long streak of consecutive sellouts. Two years later, the Food City 500’s attendance was down to 102,000. While that would be a respectable crowd for most races, it was a sharp decline from Bristol’s regular 160,000-plus. The track’s massive stadium seating only made the crowds look even smaller. While some fans might have approved of Bristol’s changes, they appeared to be in the minority. Bruton Smith had enough by 2012. After the spring race in March, Smith said he was embarrassed by the crowd. The owner conducted a poll and found 70 percent of fan respondents wanted the track changed back to the way it was before the 2007 reconfiguration. Contrary to Smith’s plans, the grinding actually made Bristol’s top lane even more favorable. For the next few years, Bristol races did feature drivers fighting for the top line in a similar fashion as to how they used to fight for the bottom. But the high-contact racing of earlier days never fully returned. Drivers found that putting the bumper to competitors in the high groove was a recipe for both cars to get swept up in accidents. As a result, Bristol began to race more like a dirt track, with slide jobs being the passing technique of choice. The PJ1 resin, which Bristol first used for the 2016 night race, is the latest attempt to restore bottom-groove racing. Typically, the sticky traction compound has worked well in the beginning portions of races, but it tends to wear off over the course of 500 laps. 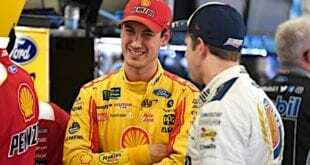 The first 200 laps of the MENCS race Sunday featured a favorable bottom lane. But by the time the rain had put the rest of the race on hold, the top groove was starting to come up. No surprise that Larson was in the lead when it stopped. Unless NASCAR can find a way to make the PJ1 more durable, it will only be a temporary solution. The current setup does present an interesting challenge of having the dominant racing line migrate over the course of a race, perhaps as it would on a bigger track. For drivers, that is good. Some fans will find a shifting racing line entertaining as well. Yet for the fans who insist Bristol should not race like a bigger track with multiple grooves, perhaps nothing more than a complete reconfiguration will be able to restore Thunder Valley’s former glory. Bristol finds itself in a somewhat unfortunate position. At no point since the 2007 reconfiguration has the racing ever been bad at the racetrack. The drivers are not wrong to advocate for the thrill of fighting for position side by side for laps on end. 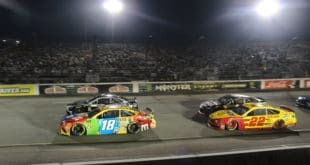 With the arguable exception of Martinsville Speedway, no other track for the last 25 years can produce a record of exciting races to match Bristol’s. Yet the track’s expansion and explosion in popularity relied on a type of racing that has been in short supply. In time, the track became a victim of its own success. For some fans, good or even great racing is not good enough if it is not “Bristol racing.” But “Bristol racing” might be impossible to bring back in the way that it existed from 1992-2007. NASCAR and SMI may find a solution that ushers in a return to high-contact competition in Thunder Valley. Or, they could be chasing a fantasy they will never be able to replicate no matter how hard they try. Drivers should not fear the first scenario coming true, but fans should not fear the second. A great race at Bristol is a great race, no matter its form. Well, Bristol may put the fans and drivers at odds, but when all is said and done, the fans rule the roost. If they don’t give the fans what they want, the drivers will have nowhere to race. The golden rule. He who has the gold rules, and controls where he spends it. Fans are voting with their feet, leaving in droves. NASCAR, and its talk programs can whistle past the graveyard, or polish the turd, but once the current television contracts expire. The broadcast networks will bring to mind NASCAR’s recent difficulties getting Monster to sign up for a one year extension. Rule of thumb: If the drivers like a track, fans don’t and vice versa. I have a feeling the old configuration is coming back sooner rather than later whether the drivers like it or not. I’m surprised it hasn’t happened already. I’m guessing that there may be financing and/or tax reasons for not pulling out the jackhammers yet. Bristol is a victim of its own success/reputation. It’s whole aura is built on the “bump and run”, “the dump and run”, and the “beating and banging”. The clips of Dale dumping Terry might be the most replayed highlights in NASCAR history. I know I should appreciate a good side by side race, but I was raised on Bristol carnage and that’s what I want. Bill B is exactly right. I had tickets to the night race…when they were still hard to get. enjoyed the racing there tremendously…the atmosphere was electric. As soon as the ‘chase’,’playoff’, whatever it’s called this month happened, the racing became so polite as to copy the bland, cookie cutters. When I found myself fighting to stay awake in the stands with over 150 laps to go, that’s when I decided it was time to save the money and give up my Bristol tickets. I prefer the new Bristol to the old one. Never been a fan of one groove racing, regardless of where it takes place. Despite the advertisements to the contrary – wrecking is not racing. If I wanted to see a destruction derby, I’d go to the county fair. If the grandstands are empty, the track should lower prices. That’s how it works in a competitive market. Moparjeff is absolutely correct on all points. For the most part I agree, wrecking is not racing. But two times a year (out of 36 races) it makes for a welcome change to see drivers behaving badly, losing their tempers, and making asses out of themselves. If that makes me a bad person then sue me. I enjoyed it and now that it isn’t the same Bristol is just another race (although, in all fairness, a 1/2 mile track will always be better than a 1.5 mile track regardless of how it is configured IMO). NASCAR leadership has driven the fans away everywhere. Bristol’s track configuration has very little to do with the empty seats. It’s just a convenient excuse. I had season tickets to the night race from before they added all of the seats and changed the track until a few years ago when my age became a factor in attending anymore. The place still provides the most exciting racing on the circuit. That is debatable but I think that the Chase definitely neutered the August race (even before the reconfiguration). Too many drivers were afraid to push it too hard for fear of ruining someone’s Chase chances. Understandably, no one wanted to be “THAT GUY”. Before the Chase it was just another race that counted towards the season long points total that still had a third of the season left (too many races left to worry about how it might affect someone’s championship hopes if you pushed the boundaries and it ended up in the wall). The consequence of ‘fixing’ something that isn’t broken. Bristol used to be totally unique in its’ configuration and the type of races it produced. There used to be no such thing as a boring race at Bristol. Change it so it races like most every other track on the circuit, and then wonder why there are empty seats? 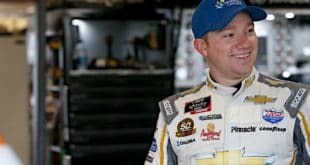 With the proliferation of 1 1/2 mile cookie cutter tracks, Nascar seems unable any more to appreciate unique, wanting the cars, the tracks, and the drivers to conform to a uniform package. So, how is that working for you guys? How is attendance? ticket sales?